Guy Fieri The Secret Sauce to "Guy's Grocery Games"
Of course, the network’s owner (Scripps) never went quite that far, but they didn’t exactly suppress the energetic and exuberant Emeril Lagasse. You’ll forgive the pun when I say Food Network “spread” Emeril all over the place…but I think you get the idea. Eventually, Emeril metamorphosed into his own “culinary brand” and is no longer with the network (at least not as a regular), but Food Network hardly missed a beat when it began showcasing a new “unofficial face” for the network -- the happy-go-lucky, Guy Fieri. “3-G” is one part game show; one part cooking show; and one part whatever Guy Fieri wants to throw in for a little extra entertainment. The action takes place in a pretty fancy supermarket (“Flavortown”) – a 55,000 square foot space designed specifically for the show. Believe me… it’s a lot nicer than anything in my neighborhood, starting with the sleek hardwood strip flooring. The general format of “3-G” is having a handful of chefs careening through the aisles of “Flavortown”, looking for specific ingredients with Guy Fieri throwing in a few curveballs along the way. Ultimately, the chefs need to prepare several servings with the adjudged winner getting a chance to go on a -- you guessed it -- shopping spree. 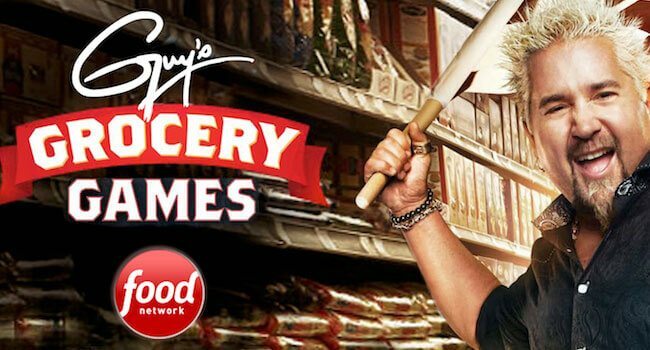 Over the 1-year period (4Q - 1Q 2015 & 2016), “Guy’s Grocery Games” has attracted well over 100 local cable advertisers who have ordered 1,300+ (equivalized) 30-second spots across 43 Viamedia markets (~60% of Viamedia’s national footprint.) That comes to an average of over eleven commercial units per advertiser. 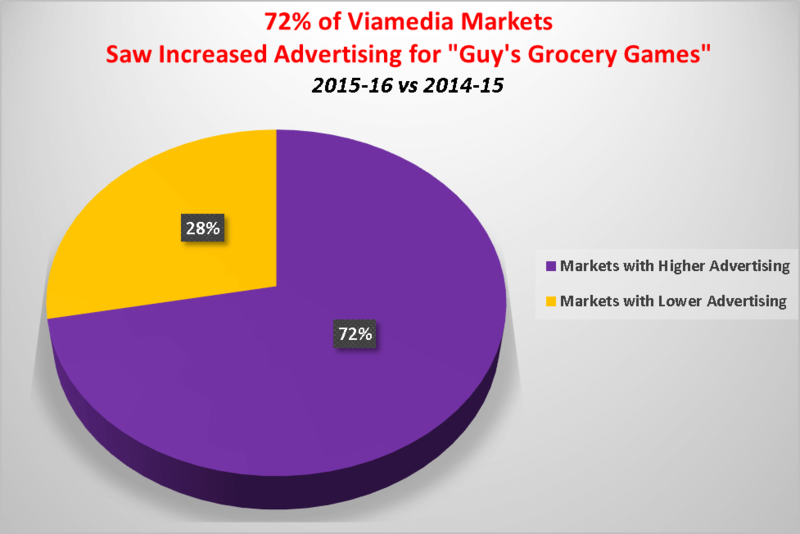 Source: Viamedia analysis of B.I.G.SM internal database (“Sports & High Profile Tracker”) for any and all local cable advertisers who invested in Food Network’s “Guy’s Grocery Games” across the same 25 Viamedia markets during the periods October – March 2014/15 & October – March 2015/16. Copyright © 2016 by Viamedia, Inc. All Rights Reserved. 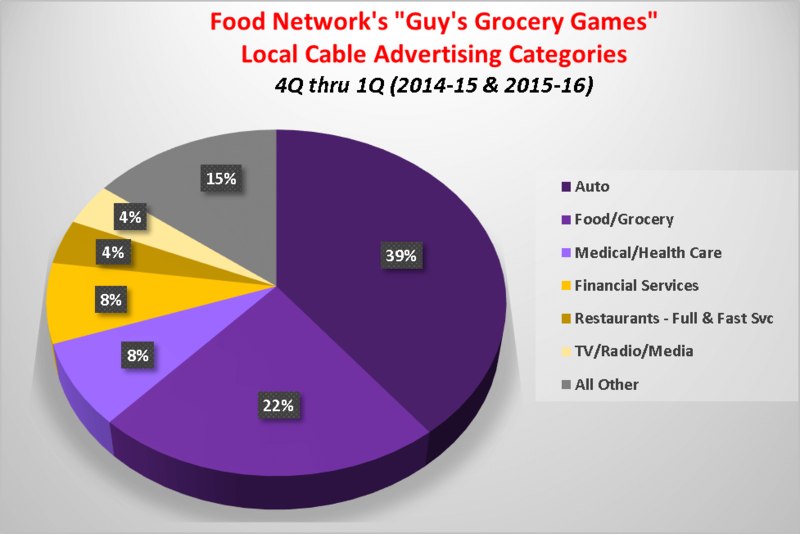 Source: Viamedia analysis of B.I.G.SM internal database (“Sports & High Profile Tracker”) for any and all local cable advertisers who invested in Food Network’s “Guy’s Grocery Games” during the periods October – March 2014/15 & October – March 2015/16 across any and all markets.. Copyright © 2016 by Viamedia, Inc. All Rights Reserved. What keeps “Guy’s Grocery Games” rolling along quarter after quarter with over 100 episodes and counting? For one thing, the show is amusingly inventive as it keeps throwing crazy new obstacles (and formats) at the “cheftestants.” There are literally dozens of them, such as the “ABC Ingredients Game”; the “Food Wheel”; “Budget Battle”; “Cart Swap” and “Aisle Down.” But the real secret sauce comes in the form of the show’s host, Guy Fieri. The directors can create all the clever segments they want, but they wouldn’t be as much fun without the energetic and very likable Guy Fieri. After all, he is the face of the entire network, not to mention this show. And he’s the real reason why audiences and local advertisers alike keep coming back for more!